Are you looking for executive car hire Essex or wedding Car hire Essex? Booking a limo for your special occasion has never been easier thanks to Crystal Chauffeurs. We are one of the most favoured, highly professional limo hire service providers in Essex. We are known to be very reliable and aim to meet all of our clients needs in the most efficient ways. You no longer have to settle for run-of-the-mill services. If you have an eye for quality and want the absolute best value for your money when in Essex, then Crystal Chauffeurs are the executive car hire company for you. Limousines still, to this day, have a very prestigious reputation. The only people who used to ride in a limo were celebrities or those who were very rich. But the price is no longer holding you back from having a limo on hire for you big day. You will be the one feeling like royalty, with Crystal Chauffeurs most luxury transportation. We have been in the car hire industry for several years and have our own fleet of vehicles so you can have the car of your choice. For your wedding day, you can arrive in style in any of our wedding cars for hire. You can choose from a Rolls Royce, Mercedes or even a Bentley. We aim to turn the wedding of your dreams into a reality. Unlike some of the other executive car hire Essex services, we do not force any set packages on you. We will give you the best service while keeping the price well within your budget. You only have to pay for the features that you use, no two customers come to us with the exact same requirements. We are here to help, and will cater to the needs unique to you. Whether you are needing wedding transportation, VIP corporate travel, airport transfers or you just want to feel like a celebrity whilst out sightseeing, we have the perfect transportation for you. Executive Car Hire Essex is becoming more and more in demand in the recent times. People love to arrive to any events in style, they love to be treated to a little luxury and the best way to do this, is to be driven around by a professional Chauffeur in a fancy executive travel car. You will be sure to make heads turn when you arrive to events in a lavish car, and you will be remembered for it. Not only this, but you will feel like the star of the evening just by arriving in perfect style. 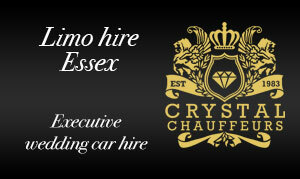 For all of your Executive Car Hire Essex needs, come to Crystal Chauffeurs. Our chauffeurs are top-class and trained to ensure exceptional services are given to you. We screen our chauffeurs very carefully, they are all fully licensed to drive chauffeur driven vehicles and are also trained in people skills to make you feel completely taken care of. Safety is one of our main priorities, we make certain that our vehicles are all serviced and working to the best of their ability before hired out to you. Have a look at our wide range of tastefully furnished vehicles for hire and choose the one you are most impressed with. Give us a call if you have any questions at all, we will be more than happy to talk you through your booking. Before you make you booking, make sure you have asked us for all your specifications and needs and we will give you a free quote. You can be assured that their will be no hidden charges in this as we pride ourselves in being very affordable and offer the best customer service along with an outstanding limo hire experience. We make a lot of promises, but we make sure that each and every promise is met right down to the last detail. Booking your executive car hire Essex or wedding car hire Essex not only takes the stress of transportation off your shoulders, it is also fun and gives you something to look forward too as a special add on to your special day. Choose Crystal Chauffeur for exceptional service, the best prices and safest rides. We are just a phone call away. Call us now!